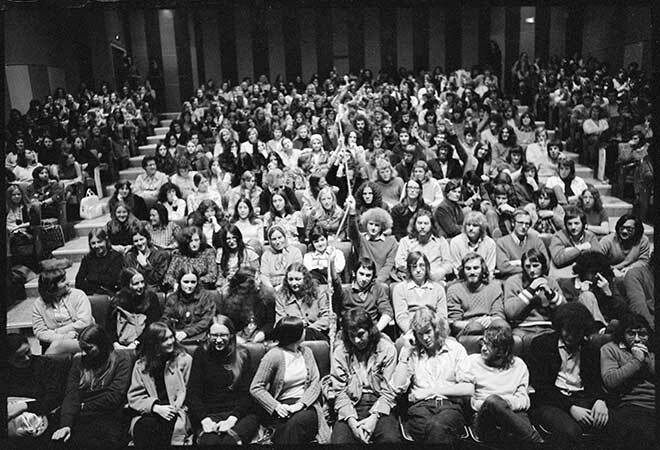 Male and female audience members are segregated by a rope barrier at a screening of the film Ulysses, at the Memorial Theatre at Victoria University of Wellington, in 1972. When the film, an adaptation of a novel by Irish writer James Joyce, was released in New Zealand in 1967, the censor considered the language used would be offensive in mixed company. He therefore decided it could only be shown to segregated male and female audiences. The university audience of 1972 may well have found this legal requirement somewhat amusing.